We check over 450 stores daily and we last saw this product for $75 at Astley Clarke. These Prismic stud earrings feature two square-cut milky aqua quartz gemstones that have been hand-cut to our specifications. 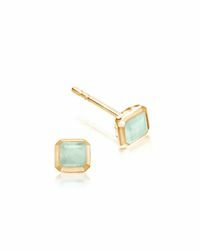 Set in 18 carat yellow gold plated sterling silver, our signature Astley Clarke setting enhances the natural colour of these gemstone earrings. Collection. Prismic. Gemstone. Milky Aqua Quartz. Dimensions. 6mm. Metal. Yellow Gold Vermeil. Metal Type. 18 carat Gold Plated Sterling Silver. James B. (23/08/2016). Excellent selection. Broad range of prices. Next day delivery was required and was delivered. Called to confirm next day delivery. Lady on phone was very helpful and polite. I would buy from them again. Pretty. Smaller than expected but Wife is pleased.